Environmental campaigners are stepping up their calls to put wind farms off-shore. The move follows new applications for so-called "monster" turbines in Devon and Cornwall. There are three applications in the two counties for turbines which measure between 240 ft and 320 ft from the tip of the blade to the ground. Standard turbines measure about 160 ft, but produce a fraction of the energy output. Campaigners, fearful that beauty spots will be ruined, have responded by calling on all wind farms to be placed off shore. Ian Hutton-Penman, chairman of the Caradon branch of the Council for the Protection of Rural England (CPRE), said the government should re-think its plans for renewable energy, published in the energy White Paper last week. In it, the government aims to double the share of electricity from renewable sources from 10% in 2010, to 20% in 2020. That could mean more pressure on Cornwall, which already has seven wind farms, and Devon, which has none. Mr Hutton-Penman called for a rethink of the government's priorities, including more energy conservation. He said: "The government has missed a vital opportunity to promote conservation. "This would significantly reduce carbon emissions." He also called for wind farms to be placed off-shore and more emphasis on tidal energy. "Tidal energy is hardly given a mention, yet figures produced by the government show that this source has the potential to satisfy all our electricity needs, with some to spare." One Devon local authority, Torridge District Council, has dealt with seven applications for wind farms in the last three years. Five applications have been refused and two are being considered. North Devon District Council has rejected two wind farm applications. Residents of the Exe Valley, where National Wind Power (NWP) wants to build three, 223-feet-high wind turbines at Bampton Down, near Tiverton have formed an action group to fight the proposal. NWP says the turbines will generate enough power for 3,000 homes. But the action group says the turbines will look out of place in an agricultural area, are inefficient and noisy and will damage tourism. An application for five 250ft turbines at Otterham, near Boscastle was refused by North Cornwall District Council in January - despite a recommendation for approval by council planners. 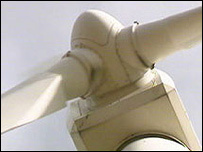 Karen Jones, of NWP, said that the new turbines meant smaller wind farms could produce more power. She said: "We have been getting almost twice the amount of electricity from machines which are not double the size."